My cherry tomatoes—I’m not thrilled with them. They’re growing okay. I just don’t like the fruit. Too big. Too thick-skinned. And the flavor fell flat. Cherries are supposed to poppable, add a brightness to a salad. These? Meh. When life gives you lemons, right? So, these cherry tomatoes went straight into sauce. Roasting brings out the sweetness they lack when just sitting on your salad. Step 1: Put about 2-3 lbs. 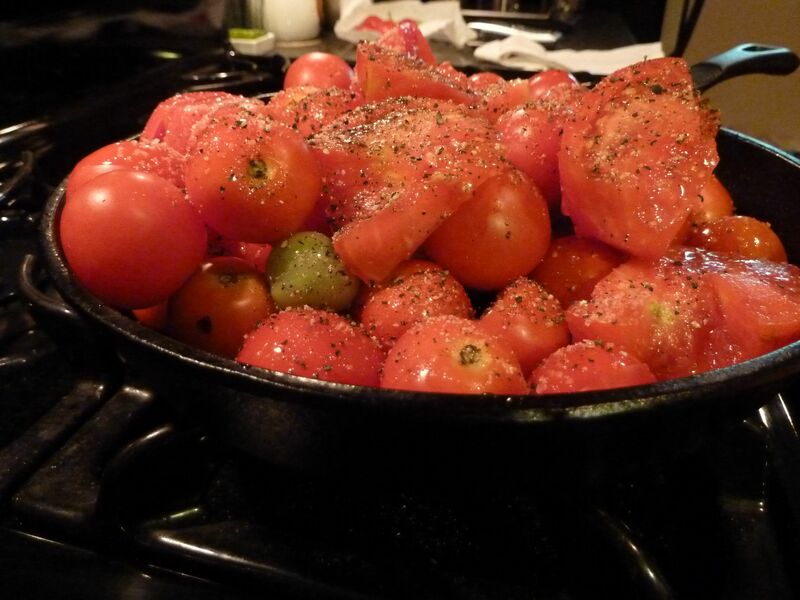 cherry tomatoes in a cast iron skillet. Add a couple of tablespoons evoo, sprinkle with kosher salt and give it a couple of turns of fresh ground pepper. Cherry tomatoes seasoned and waiting to be popped into a 425F oven. Pop it into a 425F oven for about 40 min. or until the tomato skins start bursting and the liquid starts bubbling. Let it bubble along for a total time of about 1 hour. Step 2: Your gonna get lots of juice from the tomatoes, and you want to let it cook off. 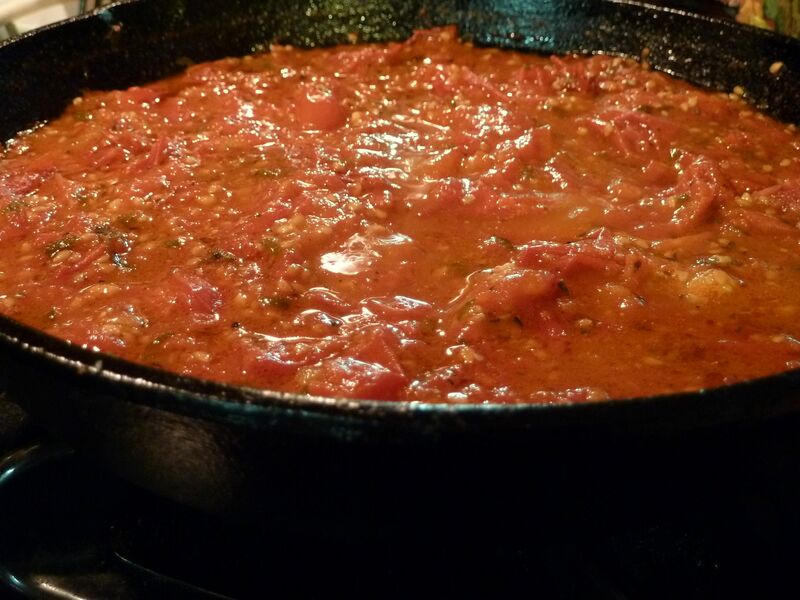 And you also want the flavor of the tomatoes come through more and get the sauce a bit thicker. So, take the skillet out of the oven and put it on the stove top over a low flame. Add 2-3 cloves of crushed garlic. Add some herbage; whatever you like. Fresh thyme or basil. Will it top a pizza? Add some chopped fresh oregano. 2Tbs is about right. Taste it for seasoning and add salt/pepper if you need to. And cook loooow and sloooooow. How long? Until enough liquid has cooked out to get the sauce to the thickness you like. In my case, 2 hours. After two hours simmering on the stove top. How easy was that? You might find it still a bit too chunky to spread on a pizza or spoon onto layers of lasagna. Whir it up in a blender or use an immersion blender if you like. And how sweet is this, uh? 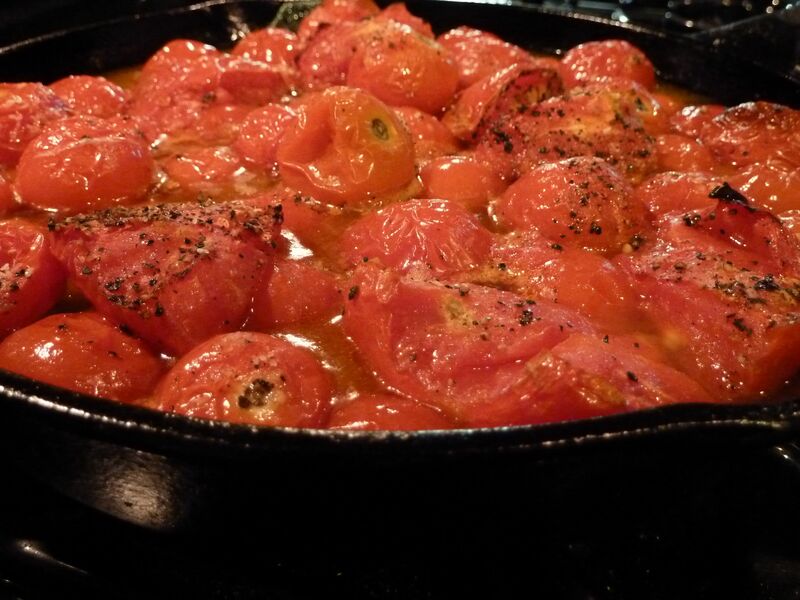 You may never go back to plum tomatoes for sauce again. This is the best part. 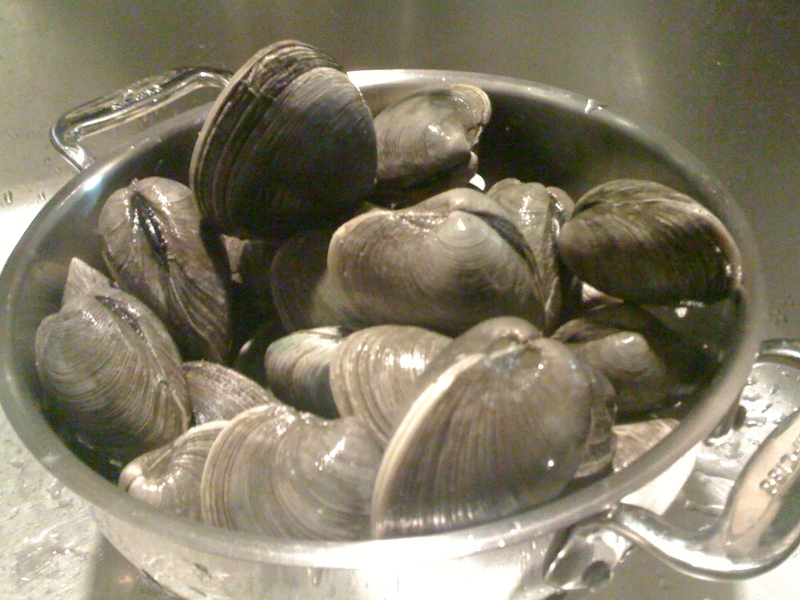 This is when the clams go from mollusk-stuffed rocks to dinner in no time at all. This is the kind of 30-minute meal I’m talkin’ about, sista. Step aside, Rach. Ellen’s makin’ dinner. Actually, Jennifer and Ellen are making dinner. 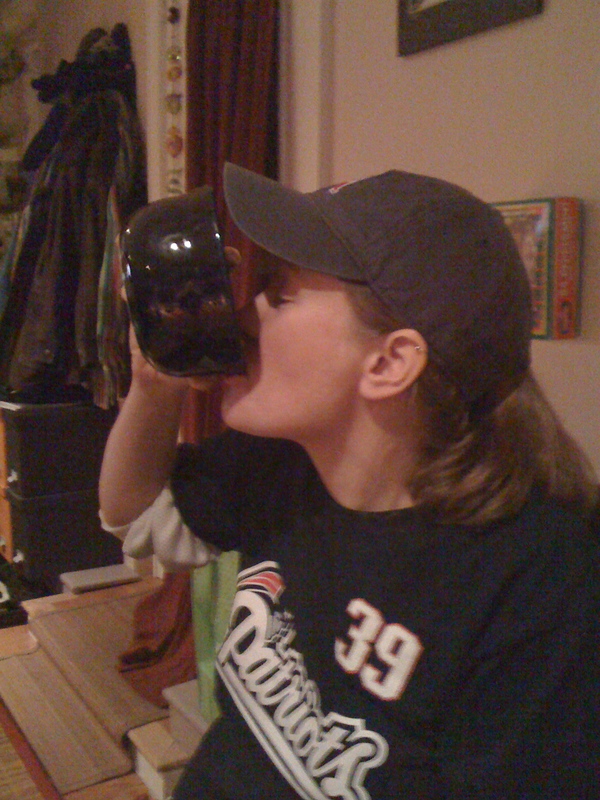 Okay, okay … Jennifer’s making dinner, I’m sous-cheffing. Large pot, filled with water, add handfuls of kosher salt until it “tastes like the sea,” as Giada would say. High heat. When it boils, throw in a pound of linguine – you know the drill. Keep an eye on doneness while you’re prepping the rest. Cook until nearly done, then just turn off the heat and let it coast in. 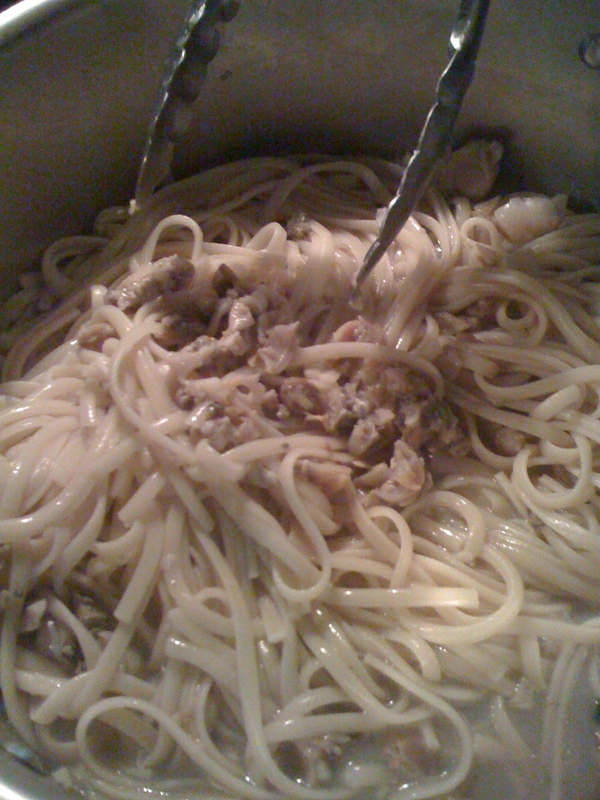 When clams are nearly done, drain the linguine. Reserve 1/2 cup cooking water to add back into the pasta if you wish. 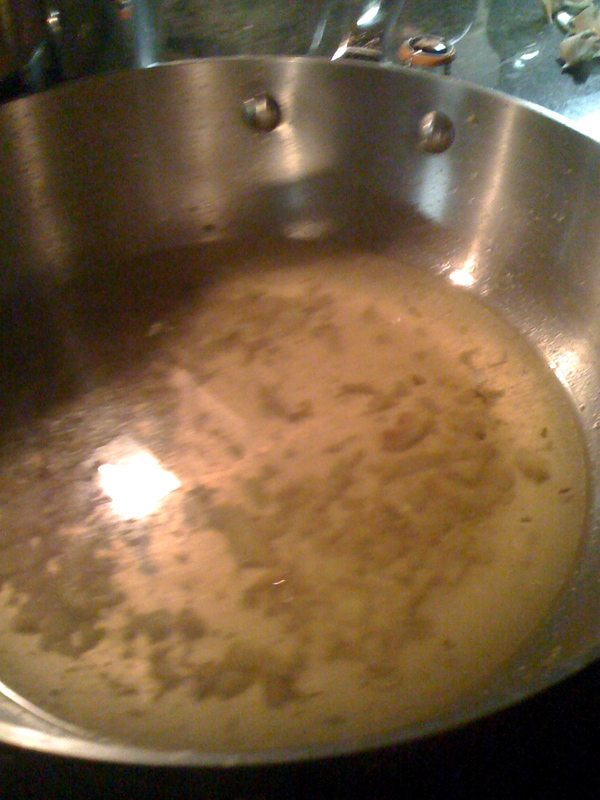 Two or three big fat cloves of garlic, smacked and minced go into a saute pan with EVOO, a tbs or two. Throw in a fresh anchovy fillet (or two for good luck). Medium heat ’til the anchovy melts and it smells like Italian heaven. Add a half cup-ish dry white wine. Nothing you wouldn’t drink yourself, but I’m not talking a Dog Point sauvignon blanc here. We used a Sevillon/Chardonnay blend that is on the I-wouldn’t-chuck-it-down-the-sink side. Clam juice – that’s right, we’re adding clam juice to clam sauce. Like adding chicken stock to something. Just a touch of added flavor. Let that come together for a bit. It’ll boil more quickly than you think. Simmah time. Mmmmm. We’re half-way there, folks. Now’s the time that some will get squeamish. It’s ok, really – the clams are destined for a greater purpose at this point. We had about 30 clams. Only about 10 at a time fit in the pan. Throw ’em in, cover, and wait for the little guys to give it up. It takes between four to six minutes, depending on size. We had some big clams that took quite a bit of time. And, something I never knew – when the clams open, it’s not like it’s a slow-motion death yawn. There’s a definite rumbling in the dying clam’s vicinity, and then a sudden “pop” – the pearly treasure reveals itself. I’m exaggerating with the pearl comparison, of course. When they open, take them out of the “juice” and pry out the meat. Reserve shells (for fumé). Add next batch to pan, and so on until they’re all cooked and open. Mince your clams. 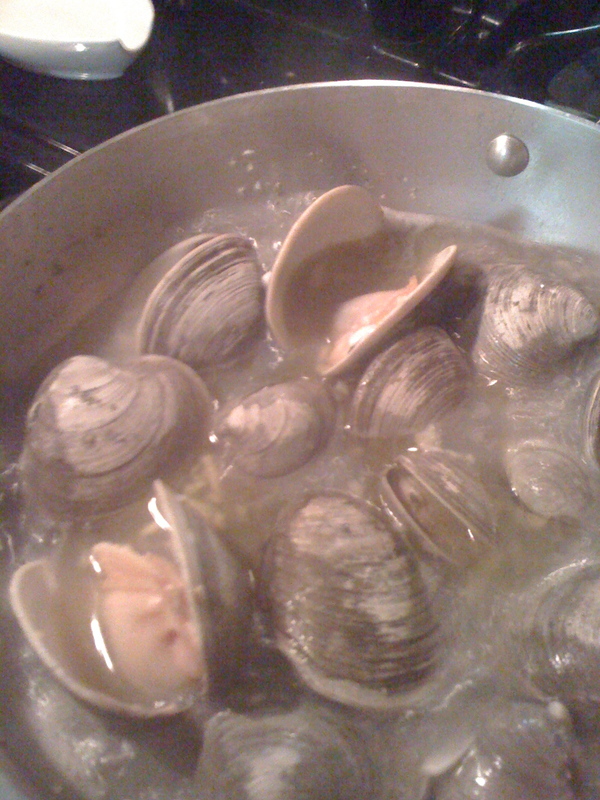 Add back to the saute pan – which now magically has way more liquid in it from the clams – and let them heat up again. Add in your pasta. Mix until amazing. Eat. Try not to slop it all over yourself. That may be the hardest part of this whole experience. You are currently browsing entries tagged with pasta at The Dainty Dot.